The family of a Coffee County man who died of skin cancer last year said even though they paid for a headstone for the grave site a year ago, they have yet to see it. 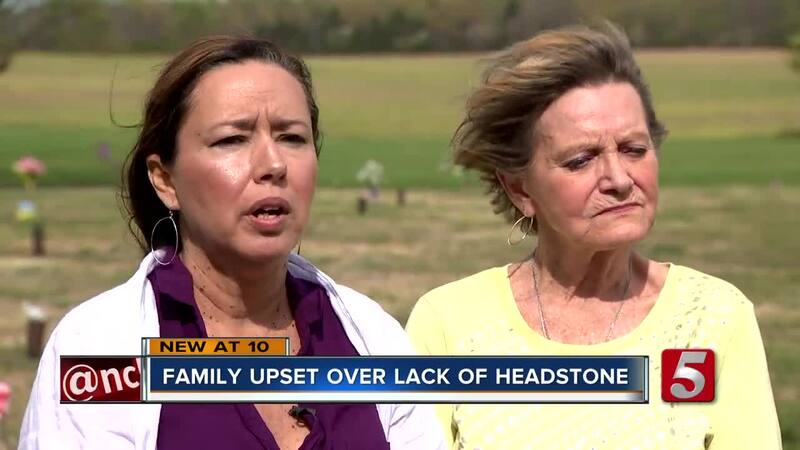 FRANKLIN, Ky. (WTVF) — The family of a Coffee County man who died of skin cancer last year said even though they paid for a headstone for the grave site a year ago, they have yet to see it. Melissa Phillips and her family drive from Manchester to Restlawn Memorial Gardens in Franklin, Kentucky to pay respects to her husband Michael. He died on March 27 of last year, and she paid nearly $2,300 for a headstone about two months later. Her order included emblems of Michael's favorite sports teams: Dallas Cowboys and the University of Alabama. However, more than a year after he was buried, there has been no sign of a headstone. "My husband doesn't have a headstone, he doesn't have anything to mark that he's been in this world," Phillips told NewsChannel 5. "He doesn't deserve to sit here like this without anything." The family paid through the cemetery owner, Eileen Santangelo, and expected to see the the headstone in several weeks or a few months. Phillips said in December, she was promised the headstone would arrive by Christmas. She alleged Santangelo claimed it would take longer because she was using new monument company. "She's telling me that everything is fine, everything is going the way it needs to go and he's going to have his headstone soon and nothing," Phillips said. Santangelo told NewsChannel 5 that there were extraneous circumstances surrounding Phillips' request. "We had to contact the NFL for use of their logos. The NFL doesn't allow you to use their logos without a license," Santangelo explained. "We sent her a bill for the $870 and still haven't gotten paid." Santangelo claimed the family owed the cemetery money for Michael's burial site since it was not where he was originally intended to be. The Phillips family denied her claim and said the plot of land was donated to them. Eventually both parties agreed that Santangelo would pay her back this weekend. Phillips said she wants the money back and plans to pay for a headstone from an independent business. "The cemetery has more than tried to do their best to get everything in order for her," Santangelo said. "It's very frustrating, and I don't feel like I'm getting anywhere," Phillips argued. NewsChannel 5 interviewed Santangelo in August 2017 after families complained that she made a poor decision to charge folks to watch the total solar eclipse on the cemetery. She later apologized. Simpson County court records show that there have been more than 20 cases against her since 2005, majority of which were civil matters that were later dismissed or settled. She also faced criminal charges including a theft by deception arrest in 2015 that was also dismissed. The warrant stated that she sold a burial spot that was already purchased decades earlier, and hadn't provided a tombstone someone bought. There is one active civil case against her that deals with a promissory note and a promise to pay $25,000 to a lender. NewsChannel 5 also discovered that she did business in Maryland, where in 2005, records show she pleaded guilty in charges of theft, failure to deposit cemetery funds and operating a mortuary service without a license.